Cornerstone Connections four-year curriculum is structured on the modern-language version of Ellen G. White’s Conflict of the Ages series. The five books provide helpful commentary on the biblical texts in the lessons. Whether you’re a teen or a teacher, you’ll want to have the books available and use them every week. 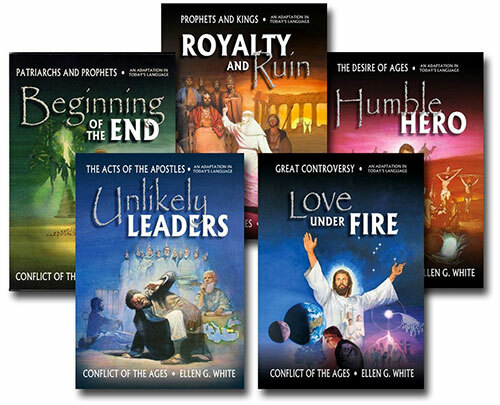 We at Cornerstone Connections extend our gratitude to the Ellen G. White Estate for providing these book resources free of charge. A variety of other writings by Ellen G. White that you can download, listen to, and read are available at EGW Writings. The first book in the Conflict of the Ages series is Patriarchs and Prophets. The title of the adapted version is Beginning of the End. This book offers commentary from Creation through the last years of King David’s life. You can read the book online here. The second book in the series is Prophets and Kings. The title of the adapted version is Royalty and Ruin. This book’s commentary covers the time of King Solomon (King David’s son) down through the reformation that took place during the life of Nehemiah. The third book in the series is The Desire of Ages. The title of the adapted version is Humble Hero. This book offers commentary on the life of Christ: His birth through His ascension (returning to heaven). Editor’s note: This is one of my FAVORITE books! I think you’re going to LOVE it! The fourth book in the series is Acts of the Apostles. The title of the adapted version is Unlikely Leaders. This book offers commentary on the life of the early Christian church and its leaders. But it doesn’t stop there; it shows how we Christians in the twenty-first century will experience and witness Holy Spirit power exceeding that of the believers present at Pentecost. You’ll definitely want to read this one! The fifth book in the series is The Great Controversy. The title of the adapted version is Love Under Fire. The book traces the history of the church and the world from the second century until the second coming of Jesus. It reveals how the controversy between Christ and Satan has unfolded just as Bible prophecy predicted. Editor’s Note: This book is definitely a page-turner! To order Cornerstone Connections Bible study guides as well as the Conflict of the Ages books, visit the online Adventist Book Center.